Weihenstephaner | Beer Apprentice - Craft Beer News, Reviews, Interviews and Info. Hi guys. 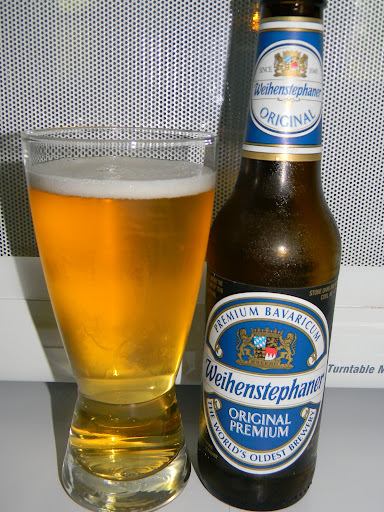 For today’s craft beer review I’m going to be giving the Original Premium produced by Bayerische Staatsbrauerei Weihenstephan located in Freising, Germany a try. It’s been quite a long time since I last had this brew and with the abundance of hot weather we’ve been having here in Kentucky lately I thought it might hit the spot. Let’s see what kind of information we can find out about this brew from the website, brauerei-weihenstephan.de. A good beer takes time. The long lager time makes our pale beer a matter of mild, flavourful beer enjoyment. Brewed in accordance with a centuries-old beer tradition on Weihenstephan HIll. This beer has an ABV of 5.1% and it comes in an 11.2 oz. bottle. It poured a very clear, golden/straw color with a very bright white head. The cap was small, sudsy and soapy. The retention time was below average and the lacing looked rather thin and meager in my opinion. The nose revealed clean and crisp hints of fresh grain and white bread. Grassy hops with an earthy tinge. A very, very light lemon citrus added a touch of complexity. Overall, well balanced and even, however somewhat relaxed. The taste was also very clean and crisp. Freshly cut hay and grassy hops dominated at the onset. The lemon sweetness pulled through more as the brew warmed. Savors of white bread, wafers and crackers helped balance everything out. The bitterness was amiable and gave a slight tickle after the swallow. The mouthfeel was medium to medium/thin. Quite dry, crisp, snappy, refreshing and thirst quenching with a very spritzy carbonation. A decent amount of flavor was left behind on the palate after each sip as well. Well, this beer isn’t too bad at all. It’s definitely one of the better Lagers out there in my opinion. The drinkability was outstanding and it matched up perfectly well with the hot and humid day on which I tried it. It was gone before I even knew what had happened. It’s pretty straight forward, but sometimes that’s all one needs when just wanting to sit back and enjoy a tasty brew on a lazy afternoon. I would have no problem offering this to someone interested in trying a craft beer. It has plenty of flavor without completely overwhelming a virgin palate. If you guys have never tried the Weihenstephaner Original Premium or if it’s been a while since you last did so, pick up a bottle next time and see if you still find it worthy. I know I did. 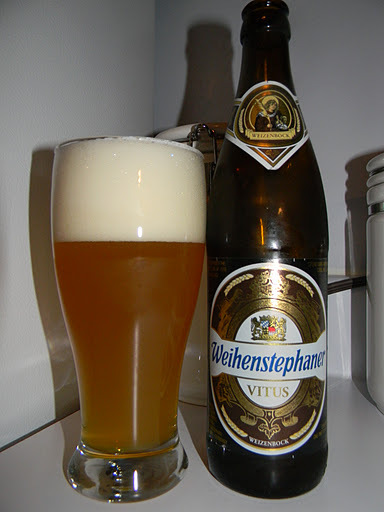 For today’s craft beer review I’m going to be trying the Weihenstephaner Vitus produced by Bayerische Staatsbrauerei Weihenstephan located in Freising, Germany. Weihenstephaner needs no introduction, so let’s see if we can find some information about this particular brew on the website, brauerei-weihenstephan.de. A light-coloured, spicy single-bock wheat beer, for both beer lovers and the beer connoisseur. Extra long and cold storage in our monastery cellars makes this single-bock a really special beer with full body and a distinctively great mouthfeel. Prost! Let’s jump right into this thing shall we? The Vitus has an ABV of 7.7% and it comes in a 16.9 oz. bottle. The beer poured a hazy orange color with some burnt yellow highlights around the bottom and edges of the glass. The crown was white, very smooth, soft and creamy. It had tremendous size along with an adequate retention time and some very nice looking lacing. The aroma was outstanding!!! It smelled just like my wife’s banana pudding!!! Ripe bananas, vanilla wafers and vanilla cream. It was nicely bready and yeasty too. A light pepper and clove spice became more evident as it warmed. Extraordinarily balanced and harmonized. Beautiful. The taste beget more of that ripe banana goodness. A slight alcohol pinch intermingled with a fresh wheat bread savor. Hints of yeast and toasted biscuits coalesced with tones of clove. The vanilla seemed a little more relaxed in the taste than it did in the aroma, but it still maintained a bit of sweetness. It tasted really nice I thought. Nothing overly complicated or confusing. Just right. The mouthfeel was medium bodied, very smooth, chewy and quite refreshing. The carbonation was spot on. It was also very dry with zero alcohol warmth. The flavor clinged to the palate for a very long time. Very nice mouthfeel with this one. In my humble and noviced opinion, this is a great beer. It’s probably my favorite of the Weihenstephaner line. Tremendous aroma and flavor. I like the fact that it was not overdone with spices. Only subtle hints that compliment the taste rather than dominate. I thought the aroma was the best characteristic of this brew. I continued to take deep whiffs until the beer was gone, and even then I still stuck my nose inside the empty glass to catch another waft. It was that good. I would love to have another one of these. It was super easy to drink and could be had at any point during the year in my opinion. I would have no problem recommending this brew to a fellow craft beer fan. I don’t normally grade Weizenbocks that high, but I’m going to have to give this beer its due. If you guys haven’t tried the Vitus yet, pick up a bottle and give it a whirl. Let me know what you thought of it when you do also. Thanks for reading and commenting folks. I really appreciate all of the support. With Kentucky going through a pretty crazy heat wave right now, I though it would be appropriate to review a Summer refresher. As I peered through my stock of beers I saw this Weihenstephaner and figured it could do the job. The Weihenstephaner Hefeweissbier is produced by the Bayerische Staatsbrauerei Weihenstephan brewery located in Freising, Germany. From the website, brauerei-weihenstephan.de, I found this description of the beer. Nothing refreshes more than this naturally cloudy weissbeer with its wonderfully rich yeasty taste. Goes very well with light meals, which are not too strongly-flavoured – veal sausage in particular. Sounds good. Let’s try it. This beer has an ABV of 5.4% and comes in a 12 oz. bottle. From the pour this beer appeared a cloudy yellow to gold, orange color with some bright (light) yellow highlights around the bottom of the glass. A huge, snow white, fluffy head was formed from a medium pour that looked soapy and rocky. After several aggressive swirls, it started to look like home-made vanilla ice cream. It had superb retention and it left some great lacing behind. The nose brought forth some very strong notes of banana along with forthcoming yeasty and wheat fragrances. I also go a light lemon hint with spices of coriander, pepper and cloves. The aroma remained constant throughout the drink even as it warmed. Very nice I thought, even though banana is not my favorite aspect of beer aromas. I found the taste to be very similar to the aroma with more of the aforementioned banana, yeast and breadiness. The spice of pepper seemed to be upfront a smidgen more while the cloves and coriander held tight as a supporting act. I didn’t find any of the lemon that I did in the aroma and all in all I found the taste to be a little more relaxed and restrained than the bouquet. It was still worthy and good, yet just not as robust or balanced as well. The mouthfeel was medium to thin, very dry, smooth, crisp, snappy and refreshing. A slight peppery burn tickled the tonsils and a nice dose of flavor was left behind long after I took the sip. 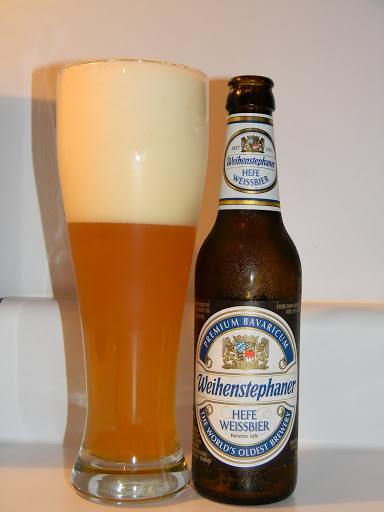 I found the Weihenstephaner Hefeweissbier to be a very easily drinkable and very good beer. A great thirst quencher for the Summer. The appearance of the brew was very appealing and tempting. This is, without a doubt, one of the better “Hefe’s” out there. Definitely worth a try if you have not sampled it. I’m sure I will pick it up again before Summer is over. I’m not, generally, a wheat beer fan, however this one peaked my interest as much as any other. What do you guys find to be the best “Hefe” or “Wheat” beer on the market today? Leave a comment and let me know.